Where's Kyra? She just celebrated her 3-month birthday with a few of her friends! Kyra is the light of our lives. It is hard to imagine life before her. She has brought so much love and laughter to our home. Our Grandchildren adore her, and Kyra misses them when they are gone. What a wonderful picture. Enjoy ur new puppy. THIS IS A PERFECT PIC FOR WHERE IS KYRA !! JUST ADORABLE. COTTON WOULD HAVE THE STUFFING OUT IN 3 MINUTES, YOU MUST BE A REALLY CALM GIRL. YOU ARE SO CUTE. LOVE YOU COLORS. Thank you for your comments. Kyra usually drags her stuffed animals all over the house too....plus any shoes, slippers, my granddaughter's toys, or socks she can find!! I put together stuffed animals from my Mom, granddaughters, mine, and Kyra's, left a hole in the middle,and filled it with a very sleepy Kyra! I also know what waiting for your little one is like. I had to wait a about 6 weeks, and it wore me out counting the days...happy, excited, and depressed!!! So adorable. I have 2 cottons. Almost 9 months. 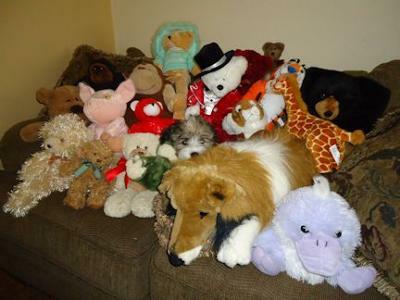 Mine would pull the stuffing out of all those stuffed animals. That is so precious. My Coton would be dragging the stuffed animals all over the house. Kyra is so cute. I enjoy hearing how much these dogs impact lives; I get mine in 4 more weeks and cannot wait. Your baby is adorable.